As energy takes on more of a global focus, so do the stocks of the companies that produce it. With the increase in hydraulic fracturing, or fracking, places once thought of as flyover states are now booming industrial areas because of the new ability to uncover deep underground stores of oil and natural gas. There's a lot of room for excavation and discovery in these areas, and companies such as Chesapeake Energy , WPX Energy , and InterOil are taking full advantage. Chesapeake, an Oklahoma-based oil and natural gas producer, has been putting up some strong numbers recently. Revenue has been climbing in the past two quarters, marking year-over-year growth of 40% and 32%, respectively. The company has also earned $0.30 per share over that period, beating estimates of $0.25. 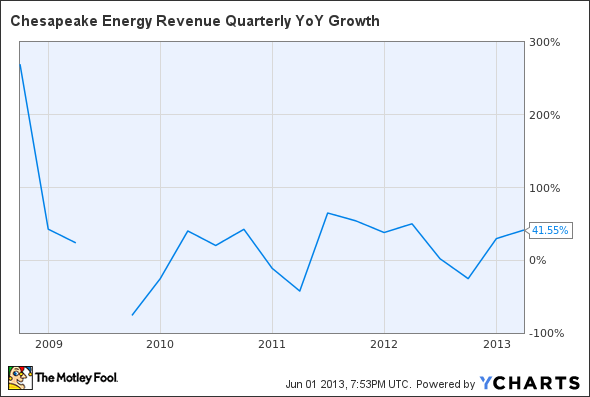 CHK Revenue Quarterly YoY Growth data by YCharts. With large stakes in the Eagle Ford and the Greater Anadarko Basin, Chesapeake has been able to vastly increase its oil production. The Eagle Ford in Texas alone has the potential to produce about 420,000 barrels per day. Chesapeake ramped up first-quarter production this year by 56%, which brought about its 40% year-over-year revenue growth. The company has already cemented itself as one of the industry's top producers, and if it can keep increasing production and decreasing costs the way it's been doing, the stock price will keep climbing at sharper angles. WPX is a greenhorn in the oil and natural gas industry with a whole lot of potential. In the U.S., it has exploration rights in the Piceance Basin, Bakken Shale, Marcellus Shale, Powder River Basin, and San Juan Basin. With all of that territory, WPX has plenty of room to run, and its stock price, which has been climbing to all-time highs, reflects that sentiment. Yet despite the recent uptrend in the market and in the individual stocks of Chesapeake and WPX, both companies are still trading well below book value. 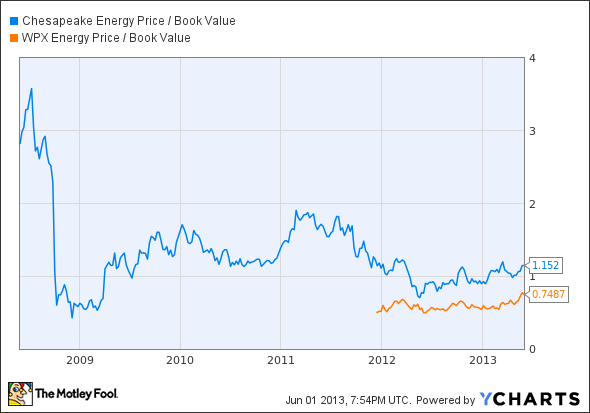 CHK Price / Book Value data by YCharts. Chesapeake's and WPX's revenues are highly correlated with the prices of natural gas. Unfortunately for them, the commodity is priced at rock-bottom levels right now. On the other hand, that could also mean major upside potential for when prices start to rise. Despite poor revenues and profit margins of late, WPX could well be a sleeping stock ready to skyrocket in the future. Both Chesapeake and WPX are primarily upstream companies; they get the oil and natural gas out of the ground and sell it. InterOil engages in the oil exploration and extraction business as well, but it also expands into the midstream (refined oil and natural gas liquefaction) and downstream (retail distribution of refined products) processes. The added diversification that InterOil's many business operations give it may make the company a good play in a market with highly fluctuating commodity prices. 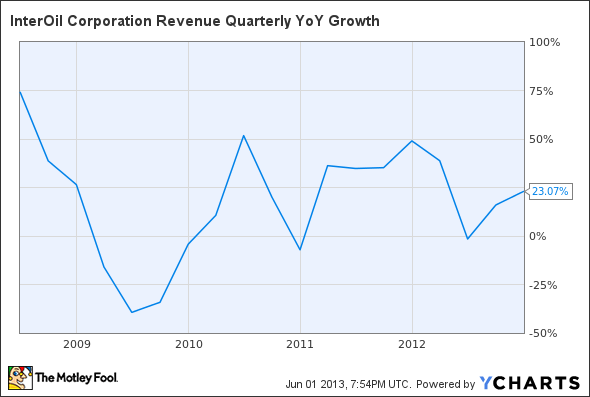 IOC Revenue Quarterly YoY Growth data by YCharts. InterOil has been enjoying solid revenue growth. Being able to not only explore and draw the resources from the ground but also to refine and sell them is a significant advantage. The company has seen year-over-year revenue growth in six of the past seven quarters, with the single outlying quarter marking just a 1% revenue contraction. It helps that InterOil has increased its refinery operating capacity for three consecutive years and has been able to expand sales of refined products, largely because of growth in aviation sales and retail businesses. Energy stocks can be a great way to diversify portfolios and gain exposure to commodities, since their performance is highly correlated. It's worth noting that the correlation can also make companies in the industry highly volatile, as we've seen in the recent past. But if you tread carefully here, you could light a fire under your portfolio, as all three of these stocks have solid earnings and high potential for future growth. The article 3 Energy Stocks to Light a Fire Under Your Portfolio originally appeared on Fool.com. Fool contributor John Del Vecchio is the manager of the Forensic Accounting ETF and is the co-author with The Motley Fool's Tom Jacobs of What's Behind the Numbers? How to Expose Financial Chicanery and Avoid Huge Losses in Your Portfolio. He owns no positions in the stocks mentioned in this article. The Motley Fool has options on Chesapeake Energy. Try any of our Foolish newsletter services free for 30 days. We Fools don't all hold the same opinions, but we all believe that considering a diverse range of insights makes us better investors. The Motley Fool has a disclosure policy.